Rajasthan High Court is going to conduct written test for the posts of Civil Judge and Judicial Magistrate on 10.07.2016. Earlier Raj. HC had completed the process of getting applications for these 72 posts. For appearing in this test, You have to download the admit card as it is mandatory. 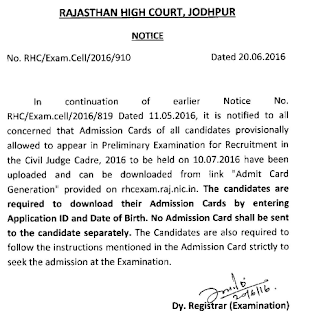 The Admit card of Rajasthan High Court Civil Judge Pre Exam had been released now. Eligible candidates can download Rajasthan High Court Civil Judge Exam Admit card from the direct link given below. Rajasthan High Court is going to conduct written exam on 10.07.2016 for Civil Judge and Clerk Grade II posts. For that, admit card are available here. Written test: Objective type questions are to be asked in the Preliminary examination. It will have 100 questions carrying 100 marks and two hours time is given to solve the paper. There is no negative marking for wrong answers given by candidates in Prelims. the Preliminary Examination shall not be counted towards the final selection. Candidates have to download Rajasthan High Court Civil Judge admit cards from the official website rhcexam.raj.nic.in via below link. All the important details like exam venue, roll number, date and time etc. had been mentioned in the admission card. Those who qualify Pre exam shall have to appear for Mains. A total of 1080 (one thousand eighty) candidates will be called to appear for Main exam. Mains is subjective type and those who clear it will have to go through interview. The candidates can download their admit card / roll no. from Rajasthan High Court website from here. Those who got selected will be given Pay scale of 27700-770-33090-920-40450-1080-44770. To qualify for Main Written Examination, the candidates of SC/ST category shall have to secure minimum 40% marks and candidates of all other categories shall have to secure 45% minimum marks in the Preliminary Examination. In order to download the admit card for Rajasthan High Court Civil Judge exam, candidates need to visit the direct link above. Then candidates need to enter their registration details and click submit. 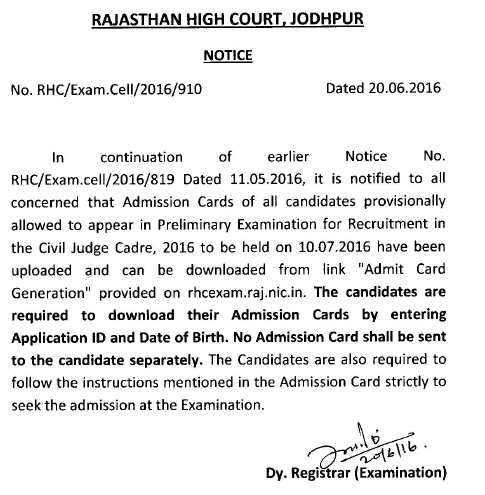 Their Rajasthan High Court Civil Judge Admit card 2016 will be shown and then a printout should be taken.